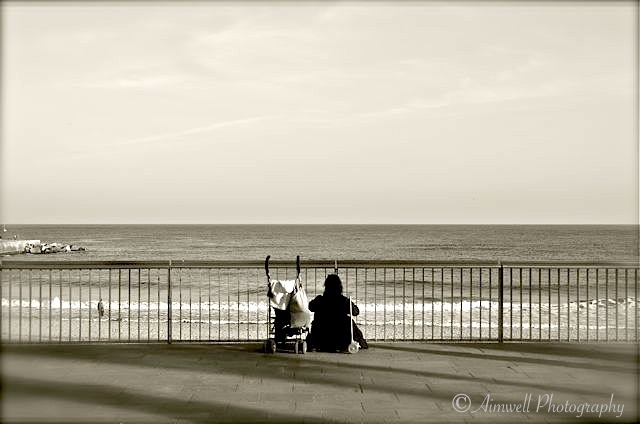 One of my favourite things to do is meditate in quiet contemplation by the water, so when I caught sight of this young mother with her baby focusing on the Mediterranean Sea I couldn’t resist capturing it. I live in rural Ontario, no where near the sea. We recently had the garden re-landscaped and installed a bubble rock. Finally the meditative essence of water in my back yard. Still, I’m looking forward to my next excursion to a somewhat larger body of water. This entry was posted in Barcelona, Europe, Musings, Photography, Reflections, Travel, Uncategorized and tagged Barcelona, Light and shadow, Photography, seascape, Spain, sunset, Travel, water. Bookmark the permalink.